Connectivism: How my connections facilitate my learning. As an adult learner, I find most of my learning comes from my desires of self-improvement. Having access to the internet through multiple devices has made my pursuit of knowledge more accommodating, but I can’t learn everything on the internet. 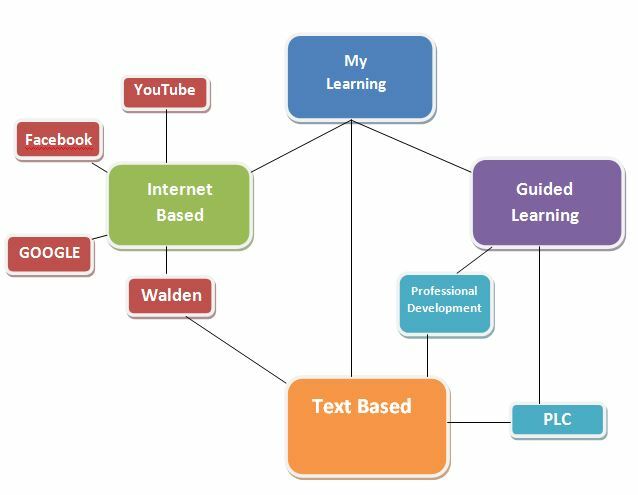 So, I would say that most of my continuing education comes in two primary forms, Guided (face-to-face) learning or Internet-based learning. I am a visual/auditory learner, and so I would much rather watch a video about content that I am interested in learning. My first source for seeking information is Google. If I am looking for topics of personal interest, I expand my search to YouTube and Pinterest because I can find videos or pictures that help me better understand the content. These sources are available 24/7, and I can access them from anywhere. I am glad that technology has allowed for instant information versus the days of the library and card catalogs. I can find almost anything on any topic of interest at any time. What surprises me is that amount of information I get through Facebook. My friends post a lot of interesting articles on politics, history, relationships, and religion. Now of course you can’t believe everything that is posted on the internet but the comments from their expansive network of friends brings about healthy debate and sometimes sparks my quest for more information on the topic at hand. My career requires that I continue my learning through professional development. Most of this continued education comes in the more traditional classroom setting or through Professional Leaning Communities. These settings afford me the opportunity to leverage the expertise of professionals in my field of work. This is a very rich learning experience, but it come at the cost of time, travel, and in some cases, money. Another disadvantage of structured learning sessions is just that, they are structured and often do not offer the flexibility of time. Both Internet-based and guided learning are support through the use of written text. Reading is fundamental in most learning experiences. I am currently completing a Masters program online, and there is an extensive amount of reading and writing involved. There are some opportunities to learn from my peers and their experiences through discussion post but it not quite the same interaction and candid communication you would get in a classroom setting. A record of my thoughts as I explore the field of instructional design.